Another great mix of folks from all over the valley attended the hike! 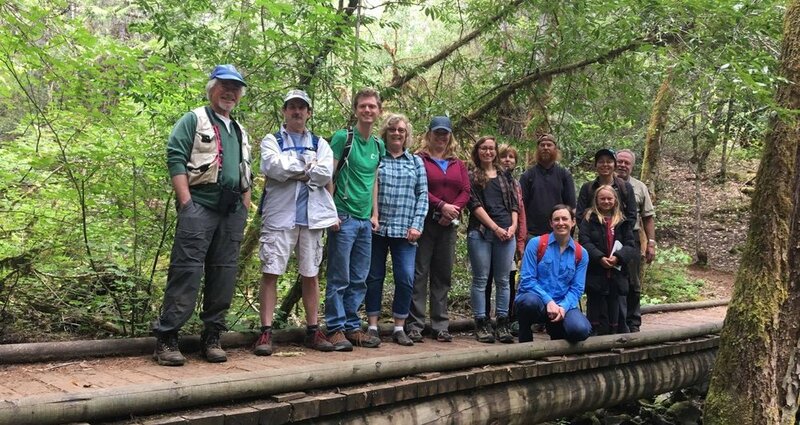 We identified a variety of plants and flowers, along with a number of trees and shrubs all along a bio-diverse hotspot just minutes outside of Grants Pass. This landscape is influenced by both serpentine and riparian habitats, so it's bursting with a plethora of rare and endemic flora, some of which were in their peak blooming season like the sweet smelling Azaleas we encountered towards the end of the hike. Katelyn from the Native Plant Society Oregon was a superb botanist and it was even better with the company of KS Wild's Ecologist, Rich Nawa and our superior volunteer Botanist, Howard Erbe providing even more great information about the area. We pointed out some moss, lichens, and ferns along the way. Among the many flowers and beautiful display of plants there were a few highlights. We discovered a patch of Yellow Groundcones, a parasitic root that feeds on the roots of the Madrone tree. And some of the biggest Lomatium's-Bare Stem Desert Parsley we've ever seen! Rich pointed out one of the best highlights of the walk, the Western Yew Tree, a characteristic of an old growth forest. It grows under the canopy of other trees and even though they are small in size, their age can be upwards of 150 years old! All in all this was a fun plant walk that highlighted how special the Siskiyous are and what makes me fall in love with this area again and again. Thanks team KS, keepin' it wild! Join us this summer for some of our other trips and events. Secret Government Timber Sales, No Way! Siskiyou Crest - Clearcuts or Wildlands?